"I have known Eloryia Ra for over 16 years and walked with her through a portion of her story. She is my angel girl as I call her and she has chosen to walk HEAVEN ON EARTH. If you are ready to chose HEAVEN OVER HELL then this book is a MUST READ. It is a challenge to chose Heaven every day but Eloryia Ra did chose Heaven and her struggle to get there is nothing short of a courageous HERO/HEROINES journey. This is walking a Mythic Journey with no guide book and no instructions sheet. If you doubt or fear, feel lost or confused, or feel like your life is a horror movie then I highly recommend reading this book to inspire you to continue your journey to finding Heaven on Earth. " Megan "Grey Wolf" Garcia author of Grandmothers "A Wisdom Teaching"
Recommended for all those whom desire to transform their lives. True Love found in this Spiritual and Metaphysical Book "ASCENSION"
A Trilogy of Transformation" Book One - "Ascension - True Love"
The Awakening: Ascension, A Trilogy of Transformation Book 1 (Paperback) I am feeling so grateful that I found this book! The author, Eloryia Ra, takes us on a journey of her life before and after her spiritual awakening. I could feel all the raw, powerful emotions as I read each page and did not want to stop! The sheer honesty and vulnerability that Eloryia pours onto the pages is heartfelt. I wish I would have read this book while going through my awakening, but it helps me look back upon my experiences and teaches spiritual lessons that we can all relate to. I truly enjoyed reading this book and thank Eloryia Ra for shinning her light and sharing her very personal story. She is magnificent. Awakening is Book One of A Trilogy of Transformation. It is an empowering tool to help you realize your Divine Magnificence. This book, although auto-bioraphical, is a hand book of practical guidance for any who read it. Woven within the story are the transformational healing applications, as well as exercises and modalities of one persons magical journey to enlightenment. 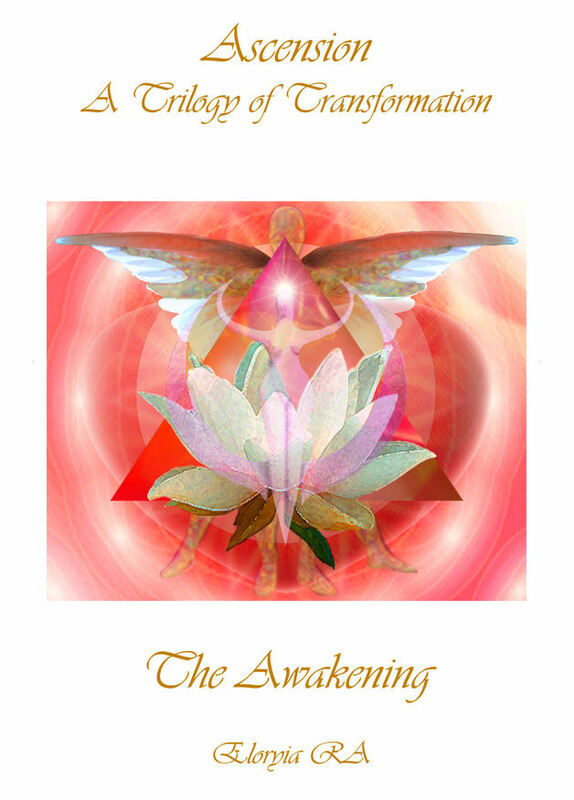 Awakening is the first book of the road map for "Ascension The Trilogy of Transformation"... How to Live Heaven on Earth"! Within the story is the guidance given to Eloryia from the Angels, in particular, the Archangels Michael and Raphael, the Ascended Masters, the Dolphins and other magical beings of light, to share with all of mankind. So that you, as well any other individual, can easily and gracefully shift from paralyzing fear into unconditional love! Giving you the freedom of self expression so that you can change your life for the better, forever! The Awakening, is recommended for all those that are just beginning their spiritual path and are realizing their value and worth through self-love and self-trust, as well as for those who may have lost faith and need a reminder of the truth of the soul they are and what their soul mission is. If you are ready to learn how to listen to your spiritual guidance, trust your intuition and follow your heart, so you may get out of your rut by transforming your every day life from the mundane muck into magical miracles.... this is the book for you! Eloryia Ra's Ascension, A Trilogy of Transformation, book one, "Awakening" is the genuine account of Eloryia as a young woman who knows she desires to assist humanity in acknowledging their divine magnificence in order to create Heaven on Earth. Her Life Coach and mentor and constant companion , the Archangel Michael, guides her life experiences and awakening to the truth of her self, by assisting her in clearing her conditioned beliefs, and the release of emotional charges so she can acknowledge her divinity. The information contained within is a divine gift bestowed upon earth to uplift all of mankind from their ongoing lower levels of darkness, into the higher realms of LIGHT! This book is recommended for all those ready to transform their lives from the mundane to the magical. It will help you realize how truly magnificent you are! Ascension is a divinely channeled gift; a tool to help you realize the preciousness of your own Sacred Being and by aligning you with the ONE source of all there is! Ascension is a guide to realize HEAVEN ON EARTH by awakening and expressing your Heart Song. The Heart song is what brings you joy in any given moment. Your Heart Song is the voice of the God/Goddess/Child within you. It is your unique expression of passion, your AT-ONE-MENT, not to be kept inside of you, but to be sung loudly for all to hear for the enlightenment of humankind and all other living inhabitants of earth. It is a handbook to PEACE OF MIND, TRUE LOVE AND THE FREEDOM TO FOLLOW YOUR DREAMS BY BEING WHO YOU ARE ! Come play and celebrate with Eloryia RA, committed to the enlightenment of humankind, as you are guided into the joyful and playful expression of your greatest magnificence, the awakening of your HEART SONG, (the divine imprint of your existence on earth and how to express it). Eloryia, more commonly known as the Angel Lady, is a Medical Intuitive, Life Coach and Transformational Facilitator, as well as a visionary artist/author, clairvoyant, teacher, high priestess, facilitator and holder of the light for Ascension /Heart song, the One Mind Council of RA, The Mastery of The 13 Laws of One. All of Eloryia's expressions are through a loving heart with the wisdom of God, the beauty and grace of the Goddess and the playfulness of the Child within. An agent of returning to the innocence of the joyful heart, the reuniting of the Twin Flame, and the alignment of the GOD/GODDESS/CHILD I AM presence, she facilitates private and or group sessions and for the past 20 years has guided hundreds of individuals out of their self -imposed painful darkness into the peace and joy of their blissful hearts. We invite you to journey with this Angel Eloryia through this inspirational story of her transformational process, guided by her beloved, the Archangel Michael, other angels, fairies, elves, dolphins and other magical beings from the mundane to the magnificent.